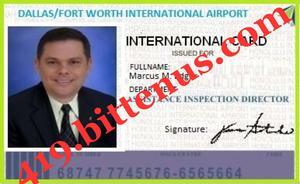 I am Mr. Marcus M. Edgar, head of luggage/baggage storage facilities (Operations,Maintenance,Transportation) here at the Dallas/Fort Worth International Airport USA. During my recent withheld package routine check at the Airport Storage Vault, I discovered an abandoned shipment from a Diplomat from Africa and when scanned it revealed an undisclosed sum of money in a Metal Trunk Box weighing approximately 110kg. 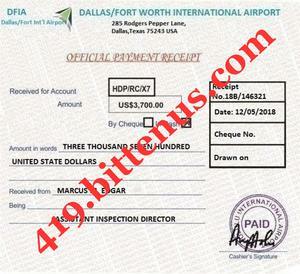 The consignment was abandoned because the Contents of the consignment was not properly declared by the consignee as "MONEY" rather it was declared as personal effect to avoid interrogation and also the inability of the diplomat to pay for the United States Non Inspection Charges which is $3,700USD. On my assumption the consignment is still left in our Storage House here at the Dallas/Fort Worth International Airport till date. The details of the consignment including your name, your email address and the official documents from the United Nations office in Geneva are tagged on! !! the Trunk box. the diplomatic agent delivering this consignment to you. busy and can not answer call at all time. Thanks for your quick reply, I have been able to secure the release of the consignment after a heated negotiation with the airport vault Authorities. I have also paid the Non Inspection fees of $3,700 which was the main reason why the Diplomat abandoned the Consignment because he was unable to pay the fee but after making payment I have been required by the Custom Airport Authority to settle the accumulated demurrage fee of $1,580 otherwise clearance will not be issue and the flight company would not board me for delivery. I am now left with only $1,000 after paying for the Non-Inspection fee of $3,700 , this process requires me to make the payment to their paying office here before they will issue their receipt for clearance, this receipts serves as an evidential prove, thereby satisfying luggage as genuine and legitimate having passed through the Dallas/Fort International Airport satisfactory inspection examination for delivery. It has now become imperative for you to support me at this point, so that, I can make this payment as required to avoid delay. What is left now is $580.00 Due to the exigent situation we need to round this up fast. Do try and send me the $580.00 so that I can add it up to complete the needed amount.Remember this payment is for the accumulated demurrage of the duration of the consignment in their custody before the clearance will be completed, As soon as the demurrage is paid I will make my flight schedule available to you to know my date and time of arrival in your city. 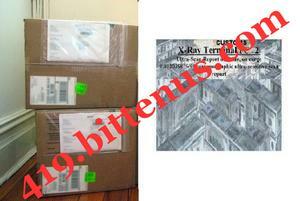 I did not bargain for this, hence your understanding and assistance is highly needed for a fast and smooth delivery of your consignment,You are to send the money through Money Gram or Western Union to my personal lawyer' s address data and this will also give them full confirmation that the consignment is going to your city. I will supply to you my lawyer' s receiver address information once I hear back from you and please get back to me immediately after reading this message so that I will provide to you my lawyer information on how and where to send the $580 to enable us complete this delivery process. This is the only role you are to play in this delivery process. I' ll leave Dallas/Fort to meet you once I receive the $580.00 from you and pay for the demurrage. I hope you recognize my effort so far in this process, in ensuring a safe delivery and to guide against any unforeseen circumstance. Find attached payment receipt for Non inspection paid together with my Identity Card.